Presenting our brief for the first time on Wednesday was slightly more nerve racking than I anticipated. I think the size of the assignment really hit a few people who also admitted they were nervous. I presented my concept for the project, which was considered an excellent concept. I did not, however, have very many visuals to support the direction I was going in or what the final work would look like. I knew this from the beginning of my presentation and actually anticipated that feedback to be the bulk of what was said. I know that’s where I need to base my work for the next few weeks. Other feedback that I wasn’t expecting was to not be so intent on taking the project to development. Gerhard pointed out that students in the past have developed interactive works with tonnes of functionality that they never get to show in their final presentation. “It’s no use having 100 functional pages if they aren’t good – better to have 3 very excellent ones“. I think it will be hard to break from my innate desire to make sure it works, to treating this more like a pitch for the full development of the app/book. work on the design of the presentation early enough so that the iterations are out of the way. make sure that the presentation is suitable for large screen visuals, not for single-viewer-onscreen presentation. Some people smashed this and it was really excellent. I was not one of those people. I have 2 presentations left in my entire university studies. I’d better make them count. 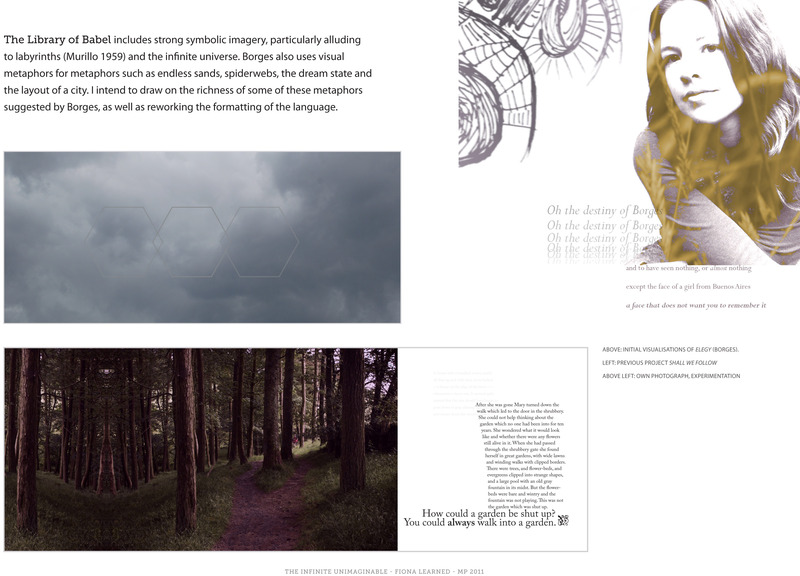 This entry was posted in Uncategorized and tagged "the brief", communicating, feedback, iterations, jorge luis borges, presentations, week 4 by princesssfi. Bookmark the permalink.